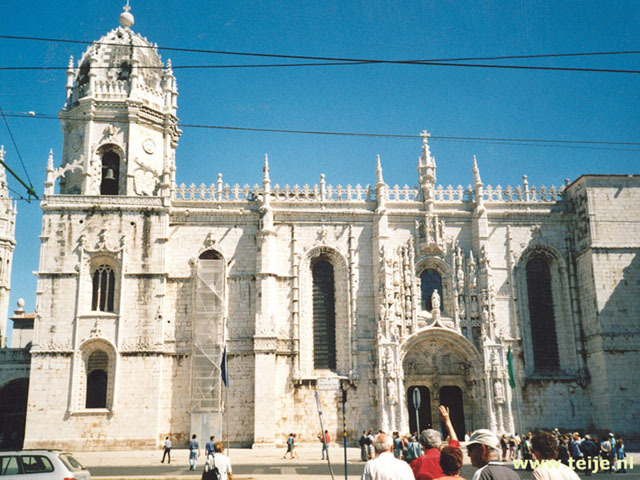 Our trip takes us first to Coimbra, the university city of Portugal since the 14th century. Like Lisbon, Coimbra has been build on the banks of a river, in this case the Rio Mondego. The differences in height are considerable and we can feel that in our legs after walking about for a few hours. Apart from the monuments in the old city centre there are beautiful parks and a big botanical garden. To the left a picture taken in park Santa Cruz. Next we drive to Conimbriga where the most extensive excavation of a Roman city is located. The settlement was founded in the 1st century AD. and was inhabited until 468 AD. when it was sacked by the Sueves. There are still excavations being carried out on this large area and probably they will find much more than they have discovered till now. Most interesting are the villa's with mosaics and the heating system for the Roman baths. A big part of an aquaduct has been preserved and part of a Roman highway. Next to the excavation grounds there is a museum with more information about the place. On the way back we take the N17, south of Coimbra, next the N2 and at Gois the N342. The first part gives a magnificent view on the river valley of the Rio Mondego and the N342 goes through the western foothills of the Serra da Estrella. But be careful, the roads are narrow and very twisting! But we have forgotten to take a new roll of film, so we can't make any pictures. During the day the sun has reappeared and the temperature has risen to an agreeable 28°C. We are back at the campsite around 5 and it is still nice enough to have a swim in the swimming pool. Tomorrow we will be on our way back to Holland so we take a last resting day. After a few somewhat colder days the weather has improved a lot and after driving through some small villages in the neighbourhoud we stay near the swimming pool for the rest of the day. We have it almost for ourselves, most of the time. From the swimming pool we can enjoy the beautiful surroundings. For a luxurious campsite like this one, it is quite cheap. The campsites in Lisbon and Albufeira have been almost twice as expensive! A compliment for the Dutch owners, Bert and Gea! We started this trip as non-beachlovers but because of the high temperatures we now love to be on the beach or swim in the water. Our journey is almost over and we want to enjoy the luxury of a swimming pool for the last time. But we think we will never just have a 'beach-holiday', we want to see and do more when on holiday. For dinner Teije gets two grilled chicken from the nearest village (only € 3,-). Our last evening in Portugal we spend in the pub of the campsite where we have some pleasant conversations and it is quite late when we walk to our tent. We want to leave early, today, but it has been very humid at night and our tent doesn't dry up. We leave quite late, but it isn't a big deal, for we have three days to drive home. After a few hundred boring kilometers through Spain, Teije wants to take some smaller roads, so he leaves the highway at Gasteiz Vitoria in the Basque country, towards the foothills of the Pyrenees. Via secundary roads to Bilbao and from there to the coast of the Gulf of Biscaje. The narrow coastal roads are beautiful, but there is a lot of traffic and no places to stop to take a picture. After driving around for a few hours we finally arrive at the French border, just past San Sebastian. But then we decide we want to get past Bordeaux today, so we won't have problems with the rush hour there tomorrow morning and suddenly we are in a hurry. But the busy traffic doesn't help much and it is quite late when we start to look for a hotel in Libourne, east of Bordeaux. We have made a trip of 1050 km. and need a rest. The city looks very attractive with it's illuminated medieval buildings but we don't find a hotel, at least not one that is open. And after an hour we decide to drive on and look for another place to stay. About 22h30 we happen to drive past a camping where the reception still seems to be open. They normally close at ten but we have been lucky. We are both very tired, but within 20 minutes we have set up our tent and are ready. It is nice enough to sit outside for another hour to relax a bit and then we fall into a sound sleep. Today we are on our way very early and go to the north of France. But we don't want to take the quickest road, so we first go to the east and then to the north, through central France. To the right Auxerre as we enter it. The last part of the journey the landscape changes and isn't so pretty anymore and we start to take toll roads, something we normally never do. At the end of the day we arrive in Rethel, north of Reims. This last night we want to stay in a hotel and find it near the railway station: Hotel du gare. The hotel is fine, but we can't recommend the food and certainly not the prices of the food: for 1 small plate with 'rabbit feed' we have to pay FF 70 (€ 10,50). We leave most of it on the plate. After a short walk through the village we early go off to bed. The last trip of this holiday, but we decide to enjoy it as much as possible and we drive extensively through the Ardennes. We stop at several villages and small towns. To the left La Roche. A few years ago Teije has been to Durbuy, the smallest city of Belgium, so he thinks Elisabeth has to see it, too. The city is very small, but it has gained a city charter sometime in the Middle Ages. It is hidden in the woods and concentrated around a city square. We walk around for an hour and then go on our way. But you will see the place later again in our travel accounts. Now we start to come upon one traffic diversion after another and it takes quite some time to pass Luik (Liege); later we learn the Tour the France has started and is going through this neighbourhood this day. Alas, after a last picture of us together in the Ardennes it is really over. That terrible moment of entering Holland again: we rather leave. But that won't be very long from now. And we have no right to complain: we have been away for a whole month, with beautiful weather, we have seen a lot, experienced a lot, what more could we ask for? We have driven almost 9000 kilometers and been to Andorra, Barcelona, Cordoba, Gibraltar, Portugal. It has been a great trip!